This spec proposes an approach to integrate Kubernetes with various OpenStack storage services, such as Cinder, Manila. Kubernetes is a platform for automating deployment, scaling and operations of application containers across clusters of hosts. Kubernetes currently supports Cinder plugin that manages Cinder volumes and makes them available for pods. In addition, there are a number of third-party implementations of Kubernetes volume plugins (i.e. Flocker, REX-Ray) that allows Kubernetes to manage volumes backed by various cloud storage providers including OpenStack Cinder. All these solutions are mainly for overcloud use cases, in which pods are deployed on a set of cloud instances. In production, there is another class of use cases, that were referred as the undercloud use cases, in which Kubernetes are deployed as a control plane service and pods are running on servers other than cloud instances (i.e. baremetal servers). Integrate Kubernetes with various OpenStack storage services, such as Cinder and Manila. Support various backends that are supported by the OpenStack storage services. Support various volumes operations including but not limiting to provision, de-provision, attach, de-attach, mount, un-mount, resize, snapshot, backup and restore. Support Kubernetes Persistent Volume (PV) and Persistent Volume Claim (PVC) . Whenever possible, reuse existing services or frameworks. For example, Kuryr-kubernetes has the framework to watch the Kubernetes API and handle changes of resources. Fuxi has implemented the logic of interfacing with various OpenStack storage services and their backends. This proposal suggested to reuse Kuryr-kubernetes and Fuxi instead of re-inventing the equivalent functionalities. Pluggable architecture. Allows integrating with custom storage solutions via plugins. Massively scalable. Support large scale Kubernetes deployment (i.e. hundreds of nodes) with massive workloads (i.e. thousands of containers). There are several ways to integrate Kubernetes with OpenStack. If Kubernetes is hosted by the cloud servers provided by Nova, users can leverage the Kubernetes cloud provider feature to provision and attach Cinder volumes to hosts. However, if Kubernetes is hosted by servers other than Nova instances, there is no perfect solution that connects Kubernetes to various OpenStack storage services. In order to integrate Kubernetes with OpenStack and satisfy the requirements above, this spec proposes to develop two components: A volume provisioner and a FlexVolume driver. The volume provisioner runs on the Kubernetes control plane and is responsible to watch for Kubernetes API for changes of PVCs and provision PVs for PVCs. The FlexVolume driver will reside on each host that runs Kubelet and it will be called out by Kubelet to perform local operations, such as attach volumes to hosts, etc.. Both volume provisioner and FlexVolume driver will consume OpenStack storage services via Fuxi server. Volume provisioner is responsible for watching Kubernetes API for PVCs and make sure the corresponding storage assets (i.e. cinder volume) are provisioned, updated, or deleted in OpenStack. The volume provisioner will implement the ‘ResourceEventHandler’ interface of Kuryr-kubernetes for handling PVC events. For each creation of PVC in Kubernetes, the Kuryr-kubernetes’s API watcher will trigger an event that will be eventually handled by volume provisioner. On receiving the event, the volume provisioner will provision the appropriate storage asset in OpenStack and create a PV in Kubernetes to represent the provisioned storage asset. The volume provisioning workflow will be in compliance with the Kubernetes’s out-of-tree provisioning specification . The provisioned PV will be populated with necessary information for the volume driver to connect to the provisioned storage asset later. The volume provisioner will call the REST API of fuxi server to do the actual provisioning, and fuxi server will in term provision storage assets by using a volume provider (i.e. cinder provider). 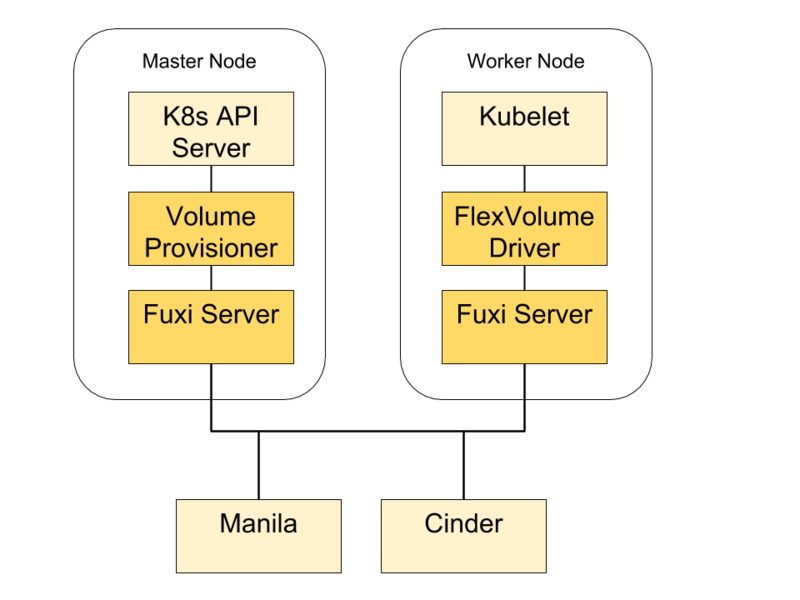 Note that fuxi was originally designed to be a remote docker volume plugin, and this proposal proposes to reuse it for fuxi Kubernetes. Similarly, for each update or deletion of PVC, the volume provisioner will call fuxi server to update or delete the corresponding storage assets at OpenStack and PVs at Kubernetes. FlexVolume  is a Kubernetes volume plugin that allows vendor to write their own driver to support custom storage solutions. This spec proposes to implement a FlexVolume driver that enables Kubelet to consume the provisioned storage assets. The FlexVolume driver will implement the FlexVolume’s driver interface that is consistent of a set of ‘call-outs’. After the PVs are provisioned by the volume provisioner, they will be picked by Kubelet and Kubelet will assign the PVs to a volume plugin based on its type. In our case, all PVs provisioned by our volume provisioner will be set to ‘flexVolume’ type so FlexVolume will be invoked to handle these PVs. FlexVolume will parse the PVs to retrieve information and pass down those information to our FlexVolume driver via ‘call-outs’. Generally speaking, PVs will serve as medium for the volume provisioner to communicate with the FlexVolume driver. The volume provisioner is supposed to populate PVs with all the data that will be consumed by the FlexVolume driver later. For example, the volume provisioner might provision a Cinder volume and set the Cinder volume’s name in a field of the created PV, so that the name can be passed down to the FlexVolume driver who will consume the Cinder volume. The FlexVolume driver will leverage fuxi to do the actual processing (i.e. connect to the volume). The initial implementation will assume an instance of fuxi server is deployed to each host that run Kubelet/FlexVolume driver so that the fuxi server and the FlexVolume driver can communicate via localhost. In the second phrase, we will investigate the possibility to have a centralized fuxi server which both volume provisioner and FlexVolume driver will consume. This might require splitting fuxi into a server and a library. The library will be leveraged by the FlexVolume driver to perform local operations (i.e. volume bi-mounting) and the server will serve cluster-wide requests. Note that FlexVolume has several known drawbacks. For example, it invokes drivers via shells, which requires executables pre-installed in the specified path. This deployment model doesn’t work with operating systems like CoreOS in which the root file system is immutable. This proposal suggests to continue monitoring the evolution of Kubernetes and switch to a better solution if there is one showed up. An alternative to FlexVolume driver is provide an implementation of Kubernetes volume plugin. An obstacle of this approach is that Kubernetes doesn’t support out-of-tree volume plugin (beside using FlexVolume) right now. Therefore, the fuxi volume plugin needs to be reside in Kubernetes tree and released with a different schedule from OpenStack. Implement a Kubernetes volume provisioner. Implement a Kubernetes FlexVolume driver.